We provide you one of the widest ranges of advanced skin care and wound care products in the industry. 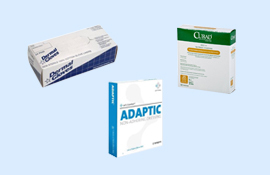 Discover wound care solutions for all phases of acute, critical and chronic wounds. We aim to help ease those concerns for your wound problem. Hundreds of wound care products available for your medical needs. We have a variety of wound care products and supplies, dressings and medical bandages for people with pressure ulcers, sores, surgical wounds, cuts and burns. Wound Care Supplies including moisture barrier, debrisoft pads, self-adhesive gel sheet, adhesive dressing, digital mini caps, cast padding, and other wound care supplies and options to choose from.